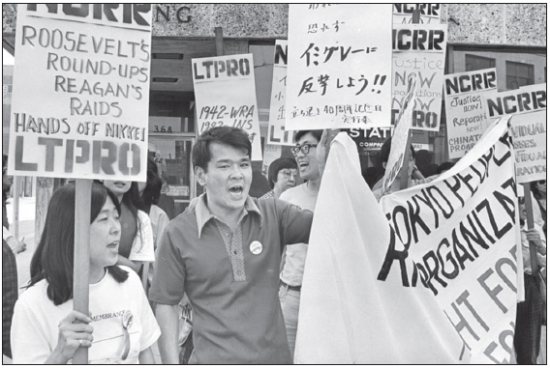 Members of LTPRO (Little Tokyo People’s Rights Organization) protest against immigration raids in the early 1980s. TORRANCE — The Japanese American Historical Society of Southern California (JAHSSC) will be dissolving in the spring of 2015, after 37 years (35 since incorporation) of providing a variety of historical and cultural programs and projects in the Southern California area. JAHSSC was founded by educators, including George and Iku Kiriyama, Don Nakanishi, Lloyd Inui, Rei Kasama, Kiyo Fukumoto, and Evelynne Matsumoto, who saw the need to educate classroom teachers about the Japanese American experience. It was the only organization existing at the time to address this need. Since then, a number of organizations have arisen to fill the need, including the Japanese American National Museum and the Go For Broke National Education Center. One of JAHSSC’s last public programs, “Generations of Action: A Community Celebrates and Looks Forward,” will be held on Saturday, Oct. 25, from 2 to 4:30 p.m. at the Katy Geissert Civic Center Library, 3301 Torrance Blvd. in Torrance. Traci Kato-Kiriyama is chairing this program, a retrospective as well as a look ahead to the future of the Japanese American community. She has gathered a dynamic group of community leaders and activists, who have been working hard at pulling together a not-to-be-missed program. Confirmed panelists and speakers include Naomi Hirahara, Allan Aquino, Evelyn Yoshimura, Glenn Omatsu, Iku Kiriyama, Karen Ishizuka, Kristin Fukushima, Sean Miura, Kathy Masaoka, Tad Nakamura, and Traci Kato-Kiriyama. The program, co-sponsored by the Torrance Public Library, is free and open to the public.